It was a little disappointing to miss the opening of three new coffee shops last month, but on the other hand, it was nice to have new places to explore after we got back! 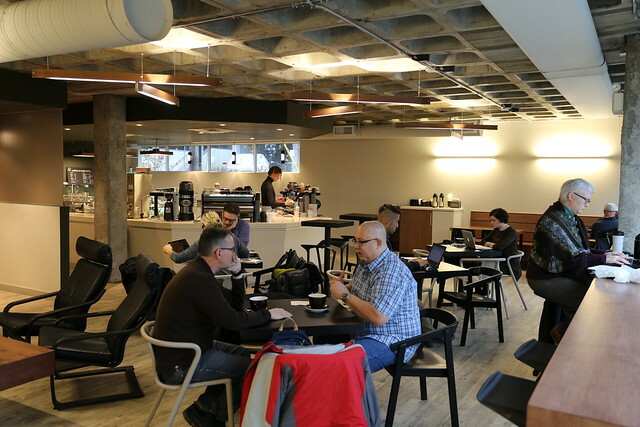 In October, Transcend returned to downtown with a new location in the Mercer Warehouse, Credo added a second location on 124 Street, and after years in the making, Burrow opened in the Central LRT Station. I checked out all three locations last week. Let’s start with Transcend Mercer. After the location on Jasper Avenue closed, I wasn’t sure if or when Transcend would be back downtown. It was pretty clear that if they did return, it would be at a smaller, more manageable location. While the new cafe in the basement of the building is smaller, it’s bigger than I was expecting! I’m not sure why but I envisioned something with either limited or no seating, but there’s actually lots of room to hang out at Transcend Mercer. I went for my usual – a vanilla latte – and looked around the cafe. There’s only one window, but the space is surprisingly bright, and I love the wood beams and ceiling. I understand they will be adding artwork around the room, so that’ll add even more color and visual interest. Speaking of color, the green counter, black wall, and brown accents definitely give you a “coffee” feeling! 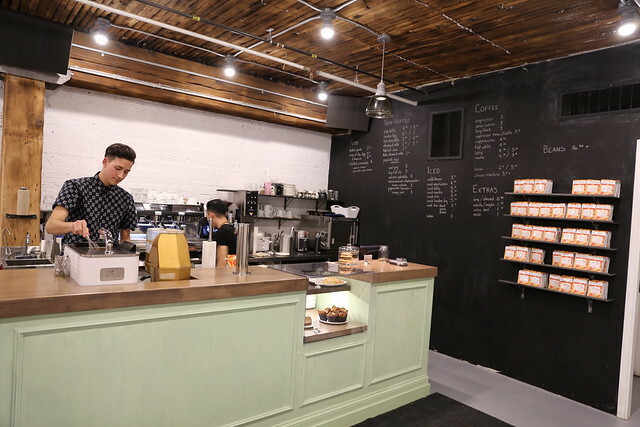 I’m sure the new cafe will be frequented by everyone in the building, and it’s great to have another coffee shop on 104 Street. I’m also happy to once again be able to buy Transcend beans throughout the week! For more on Transcend Mercer, check out Cindy’s review here! As you may know, Credo Coffee on 104 Street is my usual spot. It’s extremely close to home, has great coffee, and has wonderful service. The only downside is that because Credo is so popular, it can sometimes be difficult to find a seat. 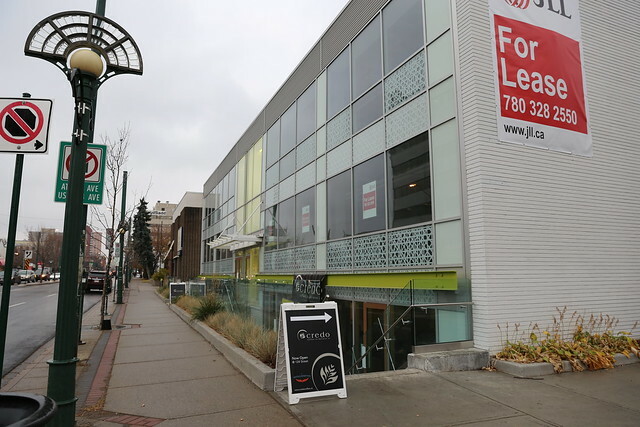 The new location on 124 Street is quite a bit bigger though, so hopefully that won’t be such an issue there! 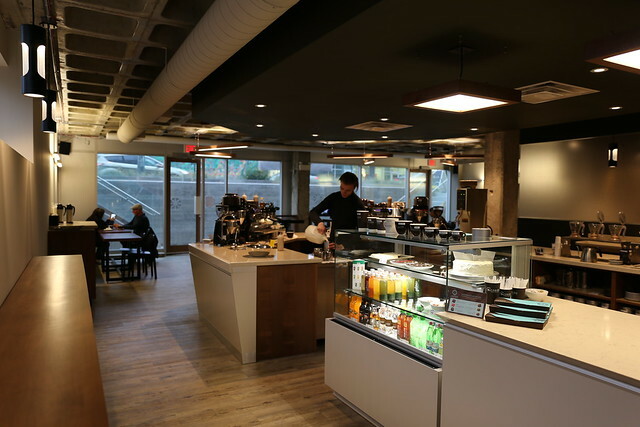 The new cafe is located at 10350 124 Street in the new Limelight building (which is just down the block from Remedy Cafe). It can be a little difficult to see, given that there are no signs on the building except for a vinyl banner where Credo is located. They are the first tenant in the building, so I hope better signage is coming. Inside is open and roomy, with lots of seating and also lots of bar space. Though Credo’s space is mostly below street level, there are lots of windows which means lots of natural light. Oddly there are a lot of power outlets up high (I guess for Christmas lights?) so you might need a long cord if you’re going to plug in a laptop (maybe they can add some outlets lower to the floor). My favorite vanilla latte was as delicious as ever, and it didn’t take long to feel right at home. I know I won’t make it to this location as often as 104 Street, but it’s great to see another fantastic addition to 124 Street. A coffee shop in an LRT station? 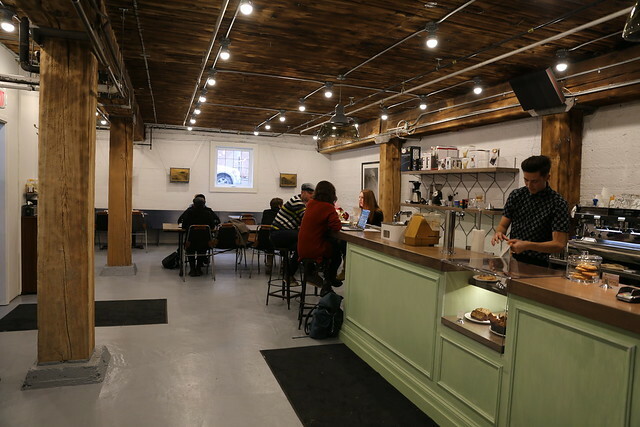 Finally Edmonton’s cafe scene has gone underground! 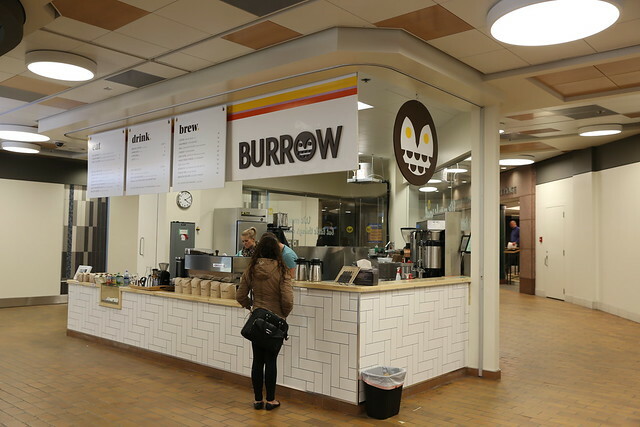 Burrow Central Station (part of the growing Elm Cafe family) is the perfect addition to our growing and increasingly popular transit system, and I hope it’s a sign of things to come. Again my expectations were exceeded – I anticipated finding Burrow tucked away behind one of the walls, but instead found it centrally located in the concourse. You can’t miss it, and now that it is there, I simply can’t remember what it looked like before. Burrow looks like it belongs, like it should have always been there. Burrow uses Four Barrel Coffee from San Francisco, which I had not tried before. I decided to stick with the usual on my first visit (ok, ok, and also my second and third visits) and ordered a vanilla latte. I was pleasantly surprised to see they make it with real vanilla bean instead of syrup! I will have to go try a simple brewed coffee one of these days. They have a rotating lunch menu with a grilled cheese sandwich too, also on my list to try. 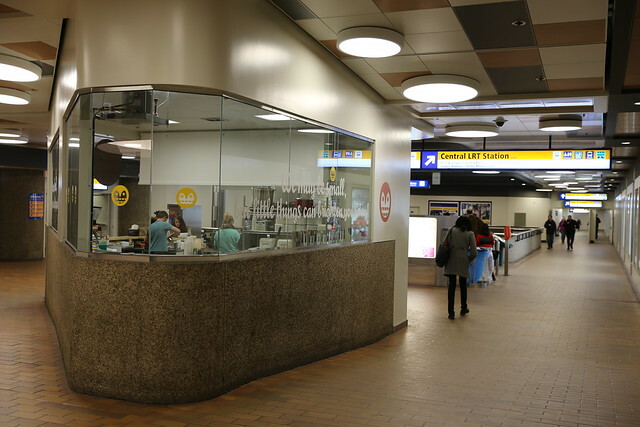 There is no seating in the LRT concourse, but for grab and go it’s hard to beat Burrow. My office is right above in the Empire Building, so I foresee many, many visits in my future! Again, check out Cindy’s review here. Have you been to these three new cafes? What did you think? If not, raise a paper cup as Omar says, and go check them out!